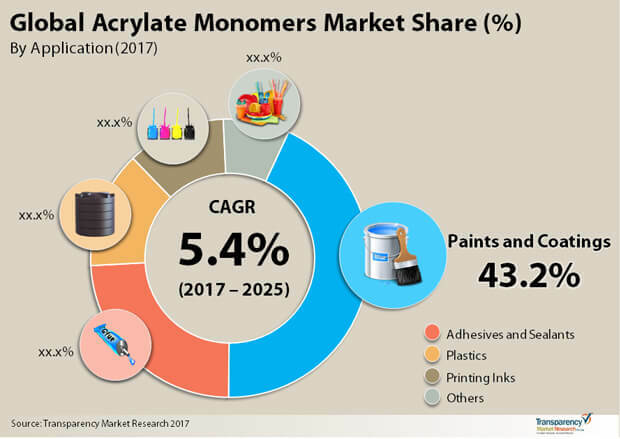 The global acrylate monomers market features a largely price-sensitive landscape, which has led several prominent players focusing on inexpensive formulations of acrylate monomers to develop cost-effective acrylic acids or esters, notes Transparency Market Research (TMR). To this end, manufacturers are increasingly entering into agreements and partnerships with original equipment manufacturers (OEM) and merchandisers, in a move to gain a better foothold in the market. However, this hasn’t deterred a number of prominent companies developing solutions on specialty chemicals to increase the product pricing, observes TMR. Among such top players are Dow Chemical Company, Evonik Industries, and Arkema. A number of players are tapping on opportunities emerging from inexpensive formulations for developing a range of high-performance specialty acrylate monomers. This has been a proven strategy to consolidate their shares in the coming years. They also opt for mergers and acquisitions in numerous unexplored geographic regions to find new revenue streams. The global acrylate monomer market stood at US$6,987.9 million in 2016 and is projected to expand at a CAGR of 5.4% during 2017 to 2025. The worldwide market is anticipated to reach a valuation of US$11,112.3 million by the end of 2025. The major product types of acrylate monomers are butyl acrylate, methyl acrylate monomer, ethyl acrylate, 2 ethyl hexyl acrylate monomer (2-EHA monomer or 2-Ethylhexyl acrylate). Of all the types, butyl acrylates and 2-Ethylhexyl acrylate are prominent segments. This is attributed to their widespread applications in various formulations in the paints and coatings industry. Regionally, Asia Pacific is the most attractive market and accounted for the leading share of the global market in 2016. The regional market is likely to emerge as a prominent pace throughout the forecast period. The growth will be fueled by the substantial demand for acrylate monomers in various end-use industries. The attractiveness of the region will also be driven the robust strides registered by key emerging economies and a staggering rise in middle class population in countries such as China and India. The widespread application of acrylate monomers formulations in making paints, inks, and coatings is a primary factor driving the market. The extensively rising use of acrylate monomers in water based coatings is accentuating the growth of the acrylate monomers market over the assessment period. Furthermore, the market will benefit increasingly from the prominent demand for water-based paints or coatings in various developed regions. The substantial use of water-based paints for household purposes is bolstering the uptake. Several attributes of acrylate monomers account for the unique chemistries that can be given to end products in the coatings inks and adhesives industry. Notable of them include remarkable water resistance ability, amazing weatherability, striking scratch resistance, and low temperature flexibility. The striking UV curability and noteworthy adhesiveness property exhibited by these monomers open it several high-performance applications in the paints and coatings industry. For instance, the rising demand for acrylate monomers for ultraviolet and electron beam curing of inks and coatings is boosting the overall market. The rising popularity of superabsorbent polymers is also proving a robust impetus to the growth of the acrylate monomers market. However, stringent regulations restricting its use owing to marked toxic nature caused by direct exposure is a crucial aspect hindering the uptake of acrylate monomers formulations in various end-use industries. On the other hand, the advent of bio-based or plant oil-based acrylate monomers in the market have allayed the concerns significantly. Rising efforts to commercialize such products are opening up promising prospects in the market. Furthermore, the substantially emerging use of acrylate monomers in polymer flooding technology as an advanced oil recovery technique in the oil and gas sector is also providing a notable fillip to the growth of the market. In particular, they find applications in modifying the physical properties of acrylamides, such as for enhancing the temperature and salt resistance ability of the polymers use in the process.